Taraflutterby recently gained a new house. Her new house came with a beautiful lawn, a budding orchard, and a backyard full of everything from poison ivy to wild blackberry. While giving us the tour of her new place this spring, Taraflutterby asked me if she could borrow some goats for general initial weed-whacking and grounds clearing. She was serious, and after some discussion, we agreed that it was entirely possible to move some of my goats to her house for a time. She would gain some low-impact, low-emissions, self-propelled brush clearing support with built-in composting ability. I would gain some really healthy and well-fed goats right during the dry summer months when I would usually have pretty poor pasture. Last weekend, I went over to her house for a walk-through and a look at both the fencing situation and the types of plants available. As the previous owners had a dog, the backyard had a lovely, wood-framed no-climb fence. As this was an overgrown edge of third-growth forest, there was a lot of underbrush of both poisonous and non-poisonous varieties. The poisonous varieties include partridge pea and pokeberry. Neither of those are poisonous in the die-with-it-in-their-mouths manner. They are more precisely described as a bad idea to be consumed in quantity. I also know that Sancho consumes pokeberry when it is available, and he is 14 years old. A goat-friend of mine is also a professor of botany. I consulted with him as well. His advice was much the same as I had received from both my vet and another local goat owner. Goats typically will not eat plants that are poisonous. In general, that is true but I also know that they can get themselves in trouble. The two big problems are wilted cherry foliage (it must be wilted) and anything in the azalea family (sourwood, mountain laurel, azaleas, rhododendron, leucothoe). As long as these are not on the property, you are likely OK. The only other challenge for that yard was shelter. We had talked about using the incomplete kids' playhouse for shelter, but it is such a nice building that it would have been heartbreaking to refinish after goat horns and toes scratched it up and ground poop into the floor. I had the brilliant flash that the goat trailer itself could be used as a mobile barn, and that was agreeable to all parties. It's not big enough for seven goats who don't care, but if there is danger and/or a really bad storm, it's plenty big for them to crowd into it and cower together. And so it was a "go" for goats to Taraflutterby's. Last weekend, I brought a bag of goat chow, bowls, water bucket, etc. when I showed up for the walk-through. This past weekend, I showed up on Saturday morning with a trailer loaded with goats and a few more miscellaneous supplies. As I brought each goat out of the trailer, I checked on and dosed as necessary for: worms, lice, toe-thrush. The four almost-look-alike girls got their initials spray-painted with Blu-Kote (spray iodine) on their sides. (photos are coming) Everyone was personally escorted through the gate at the southern end of the yard and into their summer wonderland. Immediate consumption commenced. We opened the big gates at the north end and I backed the trailer into the woods. We put cinderblocks under the tailgate so that it couldn't rock, and then left it open as strong shelter during storms. After I pulled the truck back out, the big gates closed and summer camp officially began. Taraflutterby put up a big tarp between the fence and the trailer so that there would be a rain-free area in which to offer goat breakfast and general shelter from the elemental wrath of thunderstorms. I expect that the goats have at least a month worth of forage out there. As the undergrowth gets eaten down, it will be easier to see the goats and check on their progress. I figure that we should pull them out when they start knocking down small trees to reach leaves, and/or it's time for me to get them ready for the Shenandoah show in September. Goats currently off at the Woodland Adventure Camp are: Dahlia, Pan, Taffy, Fiona, Lily, Elsa, and Emma. Coincidentally, Arashinomoui and Blushing_Grace requested some lawn mowing and fence-cleaning services for their backyard. Their yard suffers from the double problem of a lot of rain in a relatively shade-covered area (that is also a slope) so mowing was basically impossible for five weeks. Add in some opportunistic grape vines, and it was a good recipe for goat forage. As long-time readers of the LiveJournal may recall, I had a very positive first edition of goats working on suburban landscaping. Back in 2011, AmazonMink and Thunderbird borrowed Goblin, Gimble, Gyre, and Berry (if I recall the cast of characters correctly) to clear their new backyard of poison ivy in the inner suburbs. So I have their after action reports regarding Berry breaking into their kitchen in search of beer, but no trauma or drama with the yard or the neighbors. Blushing_Grace and I scouted out the backyard on Thursday evening, and discovered only one suspect fern-yew-fuzzy looking plant, some pokeberry, and a lot of miscellaneous tasty treats. The other hesitation I had was with regards to the height of the fence. The lowest fence section has very little plant life and a little dog on the other side, though, so that should serve as a deterrent. Because of Blushing_Grace's location in suburbia, the possibility of escape attempts, and the likelihood of small children wanting to meet/play with the goats, I offered Scout and Madeline for this clearing task. Both of them were bottle babies, both of them were very socialized around people from a young age, and they are both confident adults. We had a very calm unloading, toe trimming, and de-lousing/de-worming/de-thrushing moment, and the two goats immediately started taking over the yard. The good news is that Scout was willing to listen to me even when he was free to roam, thereby implying he would continue to respond to his name even with all the new, wonderful food. 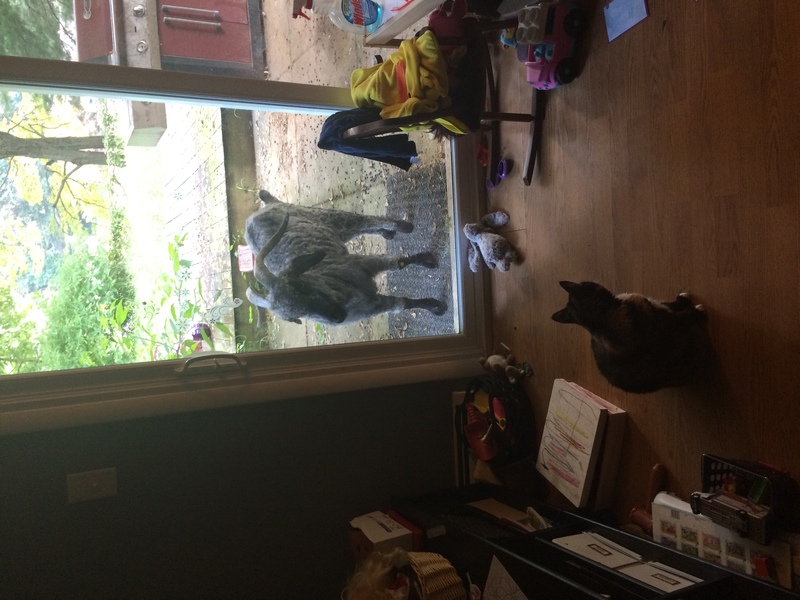 The bad news is that Scout immediately demanded entrance into the house via the sliding glass door. (See above about Berry and the kitchen.) We aren't sure if he was just insisting on being with the people or if he took offense at the cat. I told Arashinomoui that he is welcome to use either water/vinegar squirt gun or physical correction as he saw fit, but to remember not to push directly back on Scout's forehead, as that would be interpreted as a challenge to be answered. We are headed into August drought just as I'm temporarily lowering headcount and reducing pressure on the pastures. Nine goats boarded out with friends has cut my goat herd numbers by 1/3. And 1/3 of the remaining 18 goats at the farm are kids. So, in effect, the herd's food consumption was cut by almost half (about 40%). And this happened just as we stopped getting rain. It hasn't rained in a week at my house, and the change in rate of growth in the pastures is noticeable. I'm also setting up for some *very healthy* fall goats. 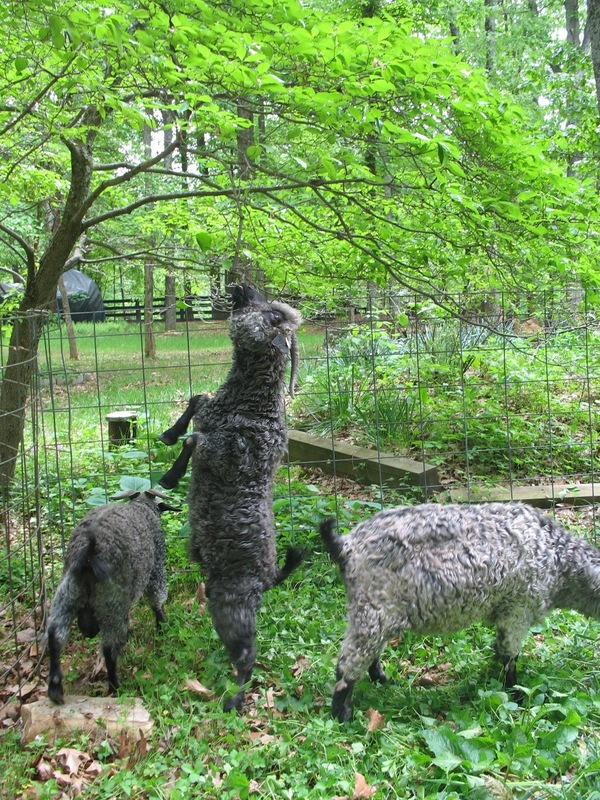 The goats are now on clean ground - no worms - eating a good variety of woody and leafy plants supplemented with goat grain. This better food should have a strong effect on their general body condition and breeding status in the fall. I sent them off with fresh de-louser, and they will be bedding down on un-loused ground, both of which will have a positive effect on their fleeces. 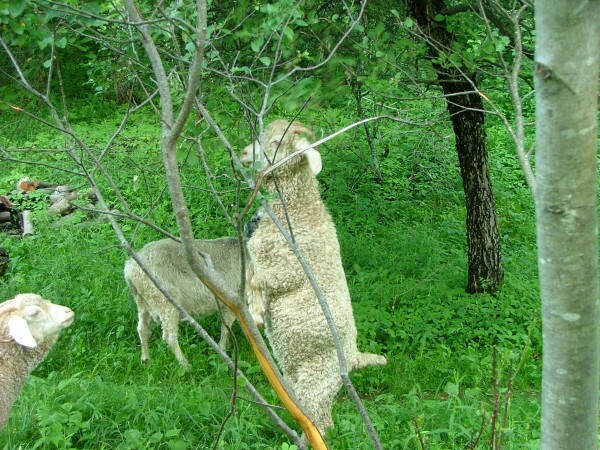 Additionally, neither location has a horrible issue of thorny vines and both places have plenty of shelter, so fleeces should stay clean and un-snagged. I'm super excited about Goat Summer Camp and pleased that, more than being useful for Tara and b_g, it'll be mostly healthy and exciting for the goats and helpful for your herd back home. Thank you! Yes, I'm very pleased at how winning this arrangement is for everyone. ... If I can get my numbers down to breed this fall, I definitely plan to bring some of these new girls forward. Woot! It's a happy, scientifically-supported excursion! My first thoughts were, "Fencing! What about fencing?" till I looked under the cut. That's the main reason I don't even entertain the notion of putting my goats out to work/summer camp/etc. I don't believe anyone except another goat owner would have the infrastructure to keep them in. "when they start knocking down small trees to reach leaves" - well, for my Janet, that would be about 5 minutes. It's her hobby. Fencing is a big concern of mine. 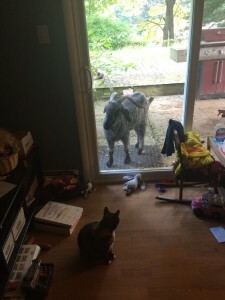 I'm not so worried about keeping my goats *in* as I am about keeping neighborhood dogs *out*. I understand that goats like to wander, but I am responsible for giving them a safe home base. That's a good photo! 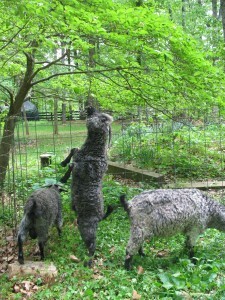 Assuredly, there are goats who like to do ballet just to get those top tasty leaves that the other goats don't. Sancho and Scout are my two most likely candidates. My comment about knocking down trees was more of a generic "watch for them to start putting in extra effort just to eat" than it was specific. You are making me want to borrow goats, even though I expect my weeds would not even qualify as an amuse-bouche for them! Unfortunately, I happen to already know that your neighborhood is known for its barbecue cook-outs. Maybe that's not the best place for goats.